Researchers in the Carnegie Mellon Textiles Lab have used the system to produce a variety of plush toys and garments. 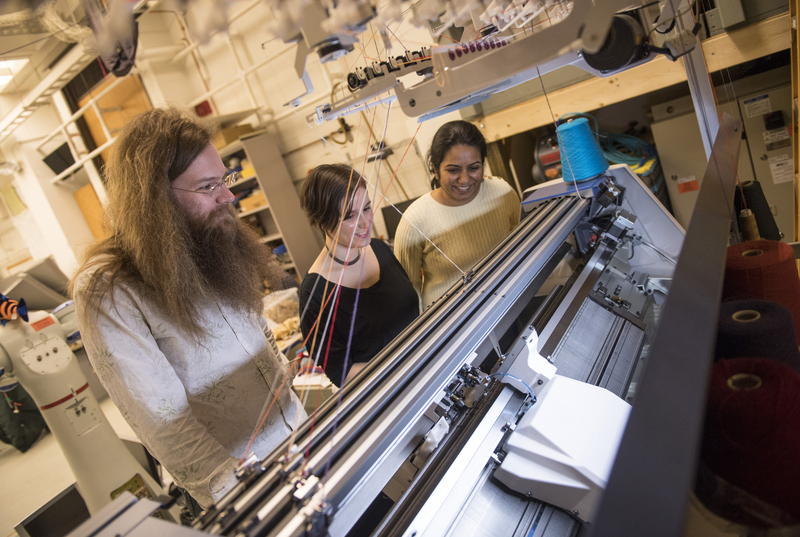 What's more, this ability to generate knitting instructions without need of human expertise could make on-demand machine knitting possible, according to James McCann, assistant professor in the Robotics Institute and leader of the lab. McCann's vision is to use the same machines that routinely crank out thousands of knitted hats, gloves and other apparel to produce customized pieces one at a time or in small quantities. Gloves, for instance, might be designed to precisely fit a customer's hands. Athletic shoe uppers, sweaters and hats might have unique color patterns or ornamentation. "Knitting machines could become as easy to use as 3-D printers," McCann said. That's in stark contrast to the world of knitting today. "Now, if you run a floor of knitting machines, you also have a department of engineers," said McCann, who noted that garment designers rarely have the specialized expertise necessary to program the machines. "It's not a sustainable way of doing one-off customized pieces." In their latest work, which will be presented at the Conference on Computer Graphics and Interactive Techniques (SIGGRAPH 2018 ) this summer in Vancouver, British Columbia, McCann and his colleagues developed a method for transforming 3-D meshes — a common method for modeling 3-D shapes — into instructions for V-bed knitting machines. These widely used machines manipulate loops of yarn with hook-shaped needles, which lie in parallel needle beds angled toward each other in an inverted V shape. The machines are highly capable, but are limited when compared with hand knitting, said Vidya Narayanan, a Ph.D. student in computer science. The CMU algorithm takes these constraints into account, she said, producing instructions for patterns that work within the limits of the machine and reduce the risk of yarn breaks or jams. A front-end design system such as this is common in 3-D printing and in computer-driven machine shops, but not in the knitting world, McCann said. Likewise, 3-D printing and machine shops use common languages and file formats to run their equipment, while knitting machines use a variety of languages and tools that are specific to particular brands of knitting machines. McCann led an earlier effort to create a common knitting format, called Knitout, which can be implemented with any brand of knitting machine. "The knitting hardware is already really good," he explained. "It's the software that needs a little push. And software can improve rapidly because we can iterate so much faster." In addition to McCann and Narayanan, the research team included Jessica Hodgins, professor of computer science and robotics; Lea Albaugh, a Ph.D. student in the Human-Computer Interaction Institute; and Stelian Coros, a faculty member at ETH Zurich and an adjunct professor of robotics at CMU. The project was also assisted in their work bya team of student developers — Yiqun Peng, Hao Ren, Xing Chen Shen, and Wen Zezhi — from the MSIT-SE program.